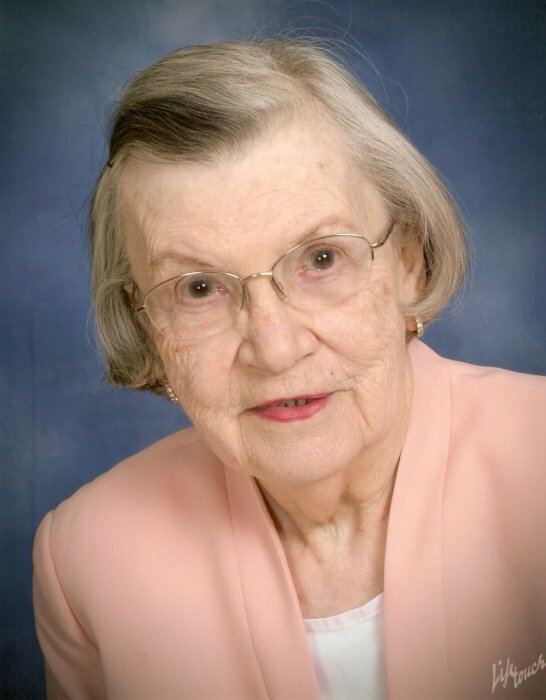 Obituary for Helen Marie (Best) VanAmburg | McCombs Funeral Home Inc.
Helen VanAmburg, 94, of Jackson, passed away Wednesday, November 28, 2018 at the Lutheran Home in Cape Girardeau. Helen was born May 19, 1924 in Cape Girardeau County, the only child of Fred and Lena Schoen Best. Helen married Cleo C. VanAmburg on June 23, 1945, at St. Paul Lutheran Church in Jackson. They had been married 62 years when Cleo passed away January 11, 2008. Helen graduated from Oak Ridge High School and attended the former Southeast Teacher’s College in Cape Girardeau. She briefly taught elementary school in Hickory Ridge, MO and later worked at Davis Electric and Jackson Oil Co.
Helen was baptized and confirmed at Zion Lutheran Church in Pocahontas. She was a longtime member of St. Paul Lutheran Church and was active in the Concordia Guild. Helen enjoyed quilting, gardening, and sewing. Helen was a loving mother and cherished grandmother. She is survived by her four children and their families: Dr. Cleo C. (Kathie) VanAmburg, Jr. of Linn Creek, Mo., and children Polly (David) Hawk, Cari Beth VanAmburg, Michelle (Shawn) McGraw, and Scott Blackburn; Susan (Tim) Smith of Ellisville, Mo., and children, Deanna (David) Bender and Stacie Smith; Steve (Linda) VanAmburg of Jackson and children, Dr. Ami (Steve) Roberts, Matthew S. (Charity) VanAmburg, and Abbie (Matthew) Edwards; Mark (Rita) VanAmburg of Glendale, AZ and children Blake (Kelli) VanAmburg and Brooke (Brian) Beaudoin; and 15 great-grandchildren, Gus Hawk; Matthew and Emily Bender; Kimberly, Gabriel, and Alivia Rau; Luke and Hayden VanAmburg; Vance, Jillian, and Pierce Edwards; Kai, Cali and Bree Beaudoin; and Charlie VanAmburg. Visitation is from 10 AM to service time, Saturday, December 1, 2018, at McCombs Funeral Home and Cremation Center in Jackson. Funeral Service will be at 11:00 AM, Saturday, December 1, 2018, at the funeral home with Rev. Jason Shaw officiating. Interment will follow at Memorial Park Mausoleum in Cape Girardeau. The family would like to thank the staff of the Lutheran Home and the hospice care providers. Memorials contributions may be made to St. Paul Lutheran Church.